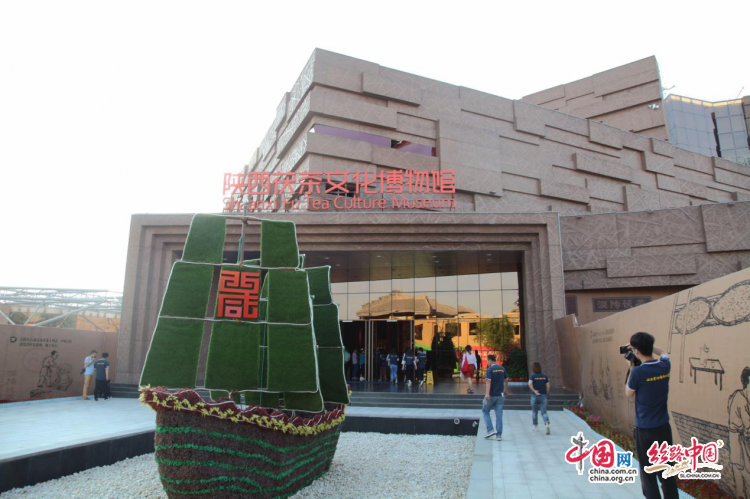 Description：Fu Tea Culture Museum, located inFucha Town, Jinghe New City, is a comprehensive museum integrating the Fu teaculture exhibition experience, quality Fu tea storage, Fu tea culture performance,and Fu tea themed dining in one. China.org.cn News (Zhou Tong)"Making tea", "take a look at sacks", hawking with strongcentral Shaanxi dialects brought the time to the scene of demands exceedingsupply of Fu tea in "Shaanxi Dao" in the past. On June 22, the themedinterview team of "Shining the New Era in Shaanxi, Piloting New Silk Road—Voiceof Shaanxi ,Via Which We Communicate With The World" sponsored byCyberspace Administration (CAC) of Shaanxi Provincial Committee of theCommunist Party of China, China Internet News Center, undertaken by Silk RoadChina Channel of China.org.cn went to Jinghe New City of Xixian New Area, visitedFu Tea Museum, strolled along the "Fu Road" and experienced culturalcharm of Fu tea. Fu Tea Culture Museum, located inFucha Town, Jinghe New City, is a comprehensive museum integrating the Fu teaculture exhibition experience, quality Fu tea storage, Fu tea culture performance,and Fu tea themed dining in one. The museum has three floors. In the firstfloor, culture development and transmission is mainly taken as the principalline to tell the source and status in the tea culture of Fu tea. The secondfloor is mainly for the space of Fu tea culture performance, mainly includingthe themed performing theater which can contain 200 audience, restaurant, andspecial stores. The third floor is mainly for training and communication of teaculture. Besides, the museum has three tea cellars, which can store about 30tons of quality Fu tea. The museum will also focus onbuilding the three special brands of “Fu Road”, “Fu Dining” and “Fu Cellar”.For “Fu Road”, Fu tea culture will be transmitted through multiple exhibitionsand performance in the theater. For “Fu Dining”, a health dining themed as Futea will be built thorugh the eurotium cristatum contained in Fu tea. And for“Fu Cellar”, the added value and collection value of Fu tea culture will bepromoted through the quality Fu tea cellar space with constant temperature andhumidity, and finally the museum will be built into the reception room ofShaanxi tea culture and experience site of China’s Fu tea culture source. It is known that the Fu tea industryformed by Fu tea culture has become one of the core industries of industrialtransformation and development in Jinghe New City. The city will, taking Fu teatown as a platform and bond, create the industry alliance of Shaanxi Fu tea,form the industrial pattern of "The South is famous for its Puer Tea andthe North is famous for its Fu Tea", making the Fu tea industry become aname card of Shaanxi.